HAVANA — The Malecon stretches for 5 miles along the coast of Havana, flanked by a line of old, pastel-colored buildings. Despite its time-worn look, this emblematic seaside esplanade buzzes with activity, with fishermen, kids, tourists and a steady stream of 1950s-era Chevrolets, Buicks and Plymouths flowing through it. The heavy damage — estimated at around 704.2 million Cuban pesos ($26.6 million) — and the prolonged disruption of basic public services, was a wake-up call. It prompted a series of actions that would eventually change the country’s approach to climate change. Cuba has a long history of climate adaptation measures, even if they weren’t originally conceived as such. Between 1967 and 1990, Cuba built a significant number of reservoirs, micro-dams and distribution channels to deal with the country’s chronic water shortages. It also planted more trees, bringing its forest coverage up from 14 percent in 1959 to 29 percent by 2015. But as weather grew more extreme, the government realized it couldn’t rely on disaster management alone. In 2005, right after Wilma broke havoc in Havana, Cuba’s Environment Agency took on the task of mapping out the hazards, vulnerabilities and risks for the entire country. The resulting study on the “Impact of Climate Change and Adaptation Measures in Cuba,” published last year, found that average maximum temperatures in the country had increased by 0.9 degree Celsius since the second half of last century. More importantly, the average minimum temperature rose by 1.9 degrees Celsius. Since 2001, Cuba has been hit by a record number of eight intense hurricanes (Category 3, 4 or 5) in the same decade. Between 2005 and 2012 alone, the damages caused by tropical hurricanes — in terms of pre-emptive measures, replacement housing, infrastructure, agriculture and loss of public services — reached almost 21 billion Cuban pesos ($792.5 million), according to the National Bureau of Statistics and Information (ONEI). The 2008 hurricane season was particularly difficult, with three major hurricanes — Gustav, Ike and Paloma — sweeping through the country, for a total loss of 9.7 billion Cuban pesos ($366 million). Approximately 643,806 homes were damaged, and agricultural and livestock costs shot up to 3.6 billion Cuban pesos ($135.8 million). Based on the latest report by the Intergovernmental Panel on Climate Change (IPCC), Cuba will face further warming, more frequent extreme weather events and ocean acidification. “Island nations have no rear guard. When the sea rises, it rises all over, and the only thing you can do is move to the center and up,” said Arnaldo Álvarez Brito, lead investigator at the Ministry of Agriculture (MINAGRI). Back then, the climate scenario suggested sea level would rise by 85 centimeters by the end of the century. However, the latest IPCC report predicted a startling change. “In February of this year, I was informed that the new scenario for sea-level rise by 2100, in Cuba, is 1.5 meters — almost twice the one we used four years ago — because now it takes into account the effects of rising temperatures over the poles,” Álvarez said. For a long, narrow island such as Cuba — with over 3,000 miles of coasts, and over 10 percent of its population living in low-lying areas along the coastline — a rise of 1.5 meters in sea level is a “big problem,” he added. “They set a sort of base line in terms of what to expect with climate change, what areas are at risk of becoming submerged due to sea-level rise, and based on that, plan the development of the country,” Goicochea said. 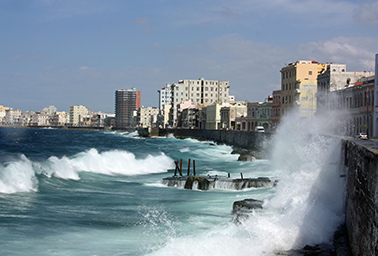 In the case of the Malecon of Havana, for example, it was determined that the area was particularly vulnerable to cold fronts and seawater intrusion, and had serious drainage issues. As a result, its zoning was modified. “Obviously, a home in the Malecon must be very pretty, and it’s much coveted, but it wasn’t viable,” she said. But it hasn’t been easy. According to Goicochea, the thing about environmental investments is that there are no “tangible” returns, making them a hard sell to most people. “Nobody takes into account the avoided costs,” she added. This became particularly evident a couple of years ago, when the government began executing a drastic program to rehabilitate the coastal area. Some of the problems, it found, it had caused. During the so-called “Special Period” — a period of economic crisis brought upon by the dissolution of the Soviet Union — the country experienced a sprawl of homes and other infrastructure on the coast, which has led to the significant deterioration of its shores. In 2000, the authorities issued a coastal protection law, which prohibited building over dunes and established a minimum distance of 130 feet from the coast. Yet it wasn’t until 2011 and 2012 that the government began to enforce the requirements. While the law stipulates that anything built before 2000 is technically “legal,” all the activity has put local communities on edge, and not without reason. In Varadero, for example, the government has a list of families that will eventually be relocated to “safer” areas. The second part of the initiative involves the recovery and restoration of the “natural barriers” in the area, whether by rebuilding dunes, protecting the coral reefs or replenishing mangroves. “As an element of physical defense of the coastal zone, we have the mangroves,” said Gisela Alonso Dominguez, president of the Environment Agency, which coordinates all climate change-related work. Mangroves act as a natural barrier, protecting the coast from erosion and seawater intrusion. They also help cushion the impact of storm surge and waves. The government not only has made sure the mangroves are protected, but also has developed a new “ecotechnology” to successfully reforest mangroves where needed. While these measures won’t stop the sea from rising on Cuban shores, officials agree they’ll buy the country more time to come up with a better solution. “Right now, all we can aspire to is to have this natural protection,” Alonso said. “So we are working on it,” she added. The program is currently being executed in the northern keys, and later on it will follow in Holguín. According to Oxfam, adaptation, mitigation and disaster risk reduction and response in Cuba are the result of a “long road travelled.” Climate change has been deemed a political priority at all levels, the report concluded. “There’s a lot of people doing this line of work, because you can’t wait to have the problem to look for a solution,” Álvarez said. National and local institutions, such as the Meteorology Institute, the Environment Agency, the Oceanology Institute and the Geography Institute, are working together to implement their adaptation plans before it’s too late. “A friend of mine has a saying: ‘The longer we take, the more vulnerable we’ll become,’ and that’s what happens,” Álvarez said. “The more you delay finding adaptation measures, the more vulnerable you’ll be. You’ll have less time, you’ll have to spend more money, money will be scarce, and the impact will be bigger,” he said.